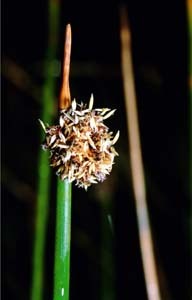 Ficinia nodosa (sagg) is a widespread, conspicuous and very common species in Tasmania. It occurs in damp areas along all of Tasmania's coastline, and also in intermittently wet areas of the drier parts of the island. It consists of tufts of stiff, erect, cylindrical stems (typically ~ 0.5 to 1 m tall, and a few mm thick), with spherical heads of flowers and fruit. These heads are attached at the ends of the scapes, but appear to be lateral because of a stem-like leaf continuing the stem. Chorizandra also has spherical heads arranged similarly on erect scapes with similar bracts, but is more aquatic and softer.